This question isn't merely hypothetical, because with modern dentistry techniques ...you can! One procedure that has become popular recently and is highly effective is called Veneers. Hamilton dentist, Dr. Barzilay can create custom Veneers to improve your smile. 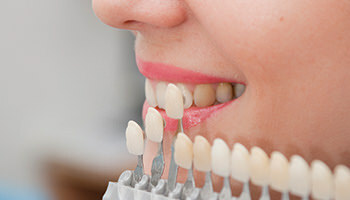 Veneers are porcelain facings that are bonded to the front surfaces of your teeth. They are made to match the shape and size of your mouth and created at the whiteness level that you desire. To perform the procedure the thickness of the veneer is "smoothed" off the natural tooth surface and the veneer is bonded to the tooth. The result feels and looks natural. After a consultation with our Ancaster dental team located in our office across Limeridge mall, you may decide that Veneers are right for you. Dr. Barzilay, our cosmetic dentist, can help you create the smile you've always dreamed of.